Whether shoppers are looking for gifts of meat or a selection of sauces and rubs, they can save 15% on them on Black Friday at Goode Company. Photo by Scott Sandlin. 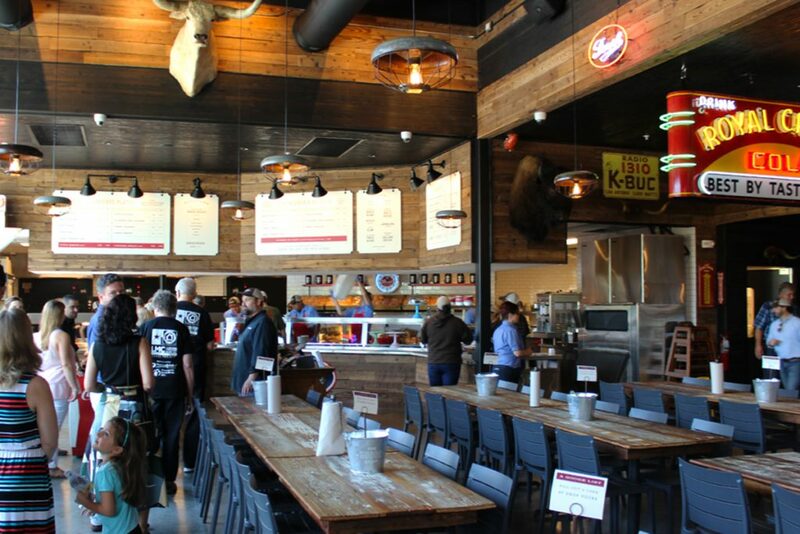 Goode Company Barbeque opens their newest location on Tuesday, August 1, in The Woodlands at 8865 Six Pines Drive. 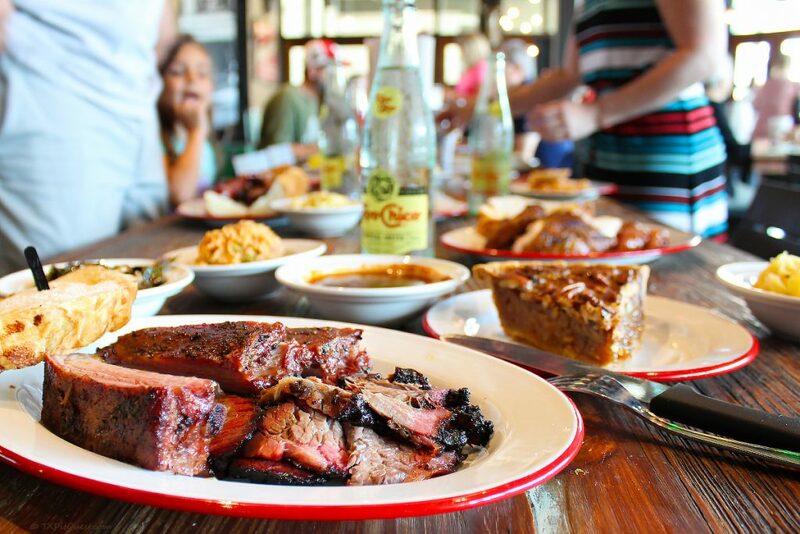 This is the first venture for the restaurant group outside Houston city limits, which started with the original Goode Company Barbeque in the former Red Barn restaurant on Kirby Drive way back in 1977. The new spot, located west of Interstate 45 and just south of Research Forest Drive, features a lineup of smoked meats and handcrafted sides similar to the original location. 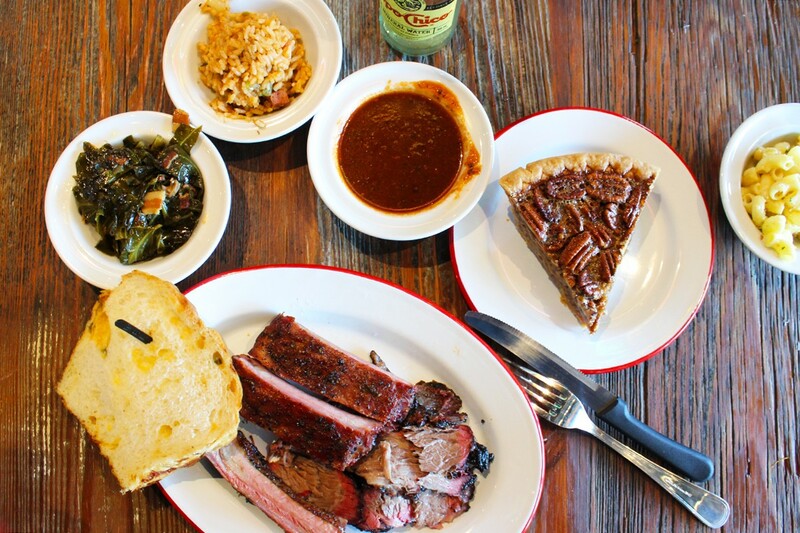 Loyal Goode Co. customers in The Woodlands now have much more convenient access to their favorite smoked meats and side dishes . Photo by Scott Sandlin. “We believe this area is a perfect fit for the Goode Company brand,” says Levi Goode, president of Goode Company Restaurants. “The family-first environment and local ‘foodie’ appreciation of good, quality food matches our values and interests.” A fifth-generation Texan, Levi attributes the Goode Company brand’s longevity and success to his family’s authentic Texas recipes that are handcrafted daily with quality ingredients. The new location is spacious and bright, with 16- to 24-foot ceilings, and floor-to-ceiling windows that face north, ideal for minimizing mid- and late-day heat gain and glare. The 4,700 square foot-space includes a main dining room that seats 156, and an adjacent private banquet area with audiovisual capabilities that seats 36. Meticulously curated objects like old signs and drink boxes from the Goode family’s collection complete a time-honored aesthetic that already has the feel of tried-and-true Goode Company digs. The service line is cafeteria-style, similar to other Goode Company Barbeque locations, and meats are freshly sliced to order. Rustic decor of the spacious dining area, featuring reclaimed wood table tops, and chicken feeder light fixtures. Photo by Scott Sandlin. Three wood-fired Oyler rotisserie pits, made by J&R Manufacturing of Mesquite, Texas, are on full display behind the serving line and carry the workload for the smoked meats. 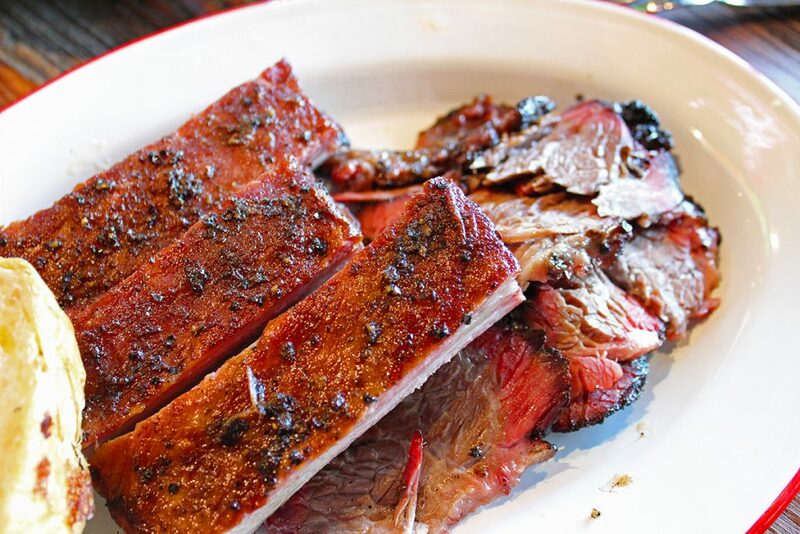 All items are cooked on 100-percent mesquite and include traditional beef brisket, Czech sausage, jalapeno cheese pork sausage, turkey sausage, honey smoked ham, spicy pork and turkey breast. Side dishes include jalapeno pinto beans, Austin baked beans, cole slaw, and potato salad for $3 a la carte, with premium sides of collard greens with smoked duck, white cheddar macaroni and cheese, and Jambalaya Texana for $3.50. Dinner plate combos include two sides and a slice of jalapeno cheese bread, and vary between $14.75 and $15.25. Two-meat dinner plates are $17.50, and three-meat plates are $18.50. Sandwiches on house-made rolls or jalapeno cheese bread are $7.25 to $7.95, and larger po-boy versions are $9.95 to $10.25. Pork spareribs and brisket. Photo by Scott Sandlin. Dessert offerings include their highly acclaimed Brazos Bottom Pecan Pie, Chocolate Cream Pie and fresh fruit cobbler of the day for $5 each, as well as fresh-baked brownies for $3.50 each. Hand-spun milkshakes, including a pecan pie shake, are $5.50, and floats made with Saint Arnold Root Beer or Dublin Dr Pepper are $6. 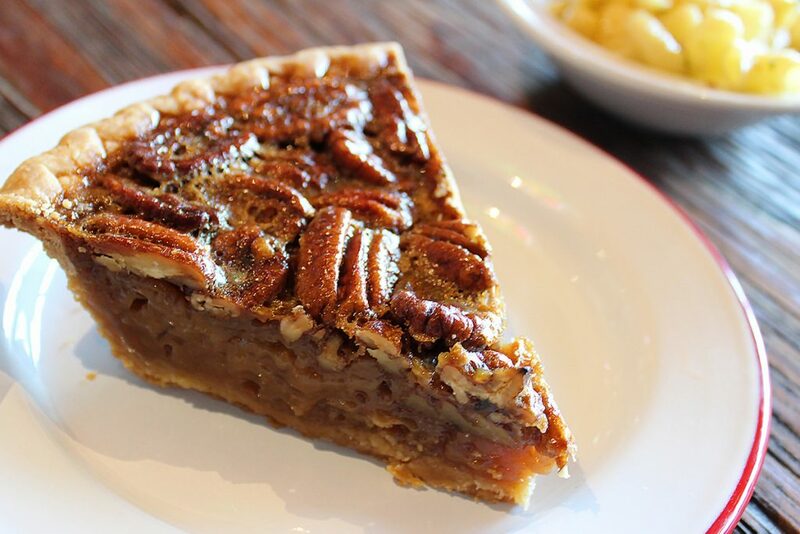 The pecan pie that built an empire, Goode Company’s Brazos Bottom Pecan Pie. Photo by Scott Sandlin. The new barbecue spot is co-located with the forthcoming Goode Company Kitchen and Cantina, which is expected to open within the month. The restaurants are connected by a roof and 2,200 square foot open air patio, with outdoor seating and interactive games for the kids. With their family-focused atmosphere, expect the new Goode Company locations to do banner business in The Woodlands area. After an enthusiastic reception last year, Goode Company Barbeque is also happy to be returning for the 2nd Annual Woodlands BBQ Festival on October 8, at Town Green Park. The Festival features some of the most talented and celebrated barbecue pitmasters from the Houston area and beyond. Open Sunday through Thursday, 11 a.m. to 9 p.m. and Friday and Saturday, 11 a.m. to 10 p.m.